UNIVERSITY RETAIL 324 • SHOPPING CENTER BUSINESS • May 2017 R etail serving college students and university staff and faculty is an opportunity that many retailers are taking advantage of. As new, clos- er-to-campus student housing opens — much of it including mixed-uses such as ground floor retail — the opportunity is presenting itself in college and university markets of all sizes. Shopping Center Business recently interviewed Matthew Stein, vice president and director of MSC University, for Philadelphia-based MSC Retail. MSC University works nationally with retailers, universities, and off-cam- pus student housing providers to plan, merchandise and lease retail and consum- er-based users in university markets. SCB : How do you determine whether you are on-campus or off-campus? STEIN : There is a nuance between what is really on-campus or off-campus, even though it may appear to be on-campus. Generally speaking, on-campus there are a number of opportunities, whether that be through a license agreement with a food service provider, third-party leasing opportunity through university owned real estate or a third-party opportunity through a public-private partnership that is on campus. From a geographical stand- point, a lot of academic institutions own real estate that may appear 'off-campus,' and is practically well off what is consid- ered 'campus,' even though it is university owned. The ownership of the land and the location of the property determine if you are on-campus or off-campus. 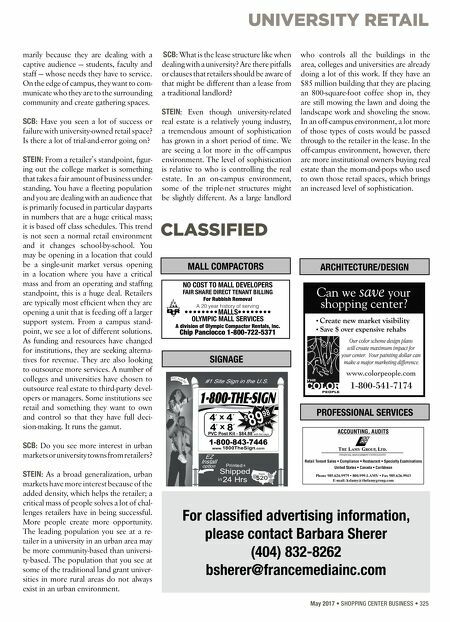 SCB : Specifically speaking about on-cam- pus real estate, what types of retailers and services are colleges and universities seek- ing for their faculty, staff and students? STEIN : On campus, institutions of high- er learning are, by and large, looking to communicate the quality and character of their university through a ground floor retail experience. That can mean different things to different institutions, and differ- ent things on different parts of their cam- pus. From a planning standpoint, a lot of this is cyclical. For a long time, universities developed their real estate inward, and as a function of that, turned their backs to the surrounding communities. Recently, colleges and universities are getting away from that. They are engaging the commu- nity and they want to be a part, if not an anchor, of the community. They want to show that they offer a social component to the lives of the surrounding local resi- dents. That includes retail-facing opportu- nities that may not be available in the area. We are seeing more engagement from the universities. As part of that engagement, some universities want to work with lo- cal businesses and independently-owned operators versus national chains. They are focused on a more authentic experi- ence and offering that speaks to the place where they are located. We see retail needs met much more definitively in a black-and- white scenario in more inward-facing real estate that universities own. That is pri- Retail And The University Environment Retail, food and beverage are finding their way on- and off-campus more frequently. Shopping Center Business interviewed a national expert on university retail to find out why, and how, retailers are interested in campus life. Interview by Randall Shearin Fringe Clothing is a local boutique clothing store, located in the base of the Sterling Frisco student housing project adjacent to the University of Arkansas in Fayetteville, Arkansas.